Happy New Year! Got those January blues? Dance them away – at least go see some dance! 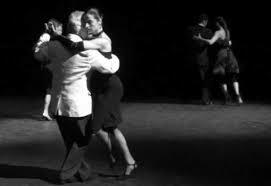 What better way to start the new year but to feel the passion of tango? Tonight and tomorrow night, New Works presents Tango Poema, an evening of Argentine Tango featuring solo pianist Linda Lee Thomas, leader of Vancouver’s tango trio Tangissimo and principal pianist for the Vancouver Symphony Orchestra. Exploring tango’s many dynamic forms, past and present, Tango Poema features performances by ten Vancouver tango dance talents, including spoken word and solo tango choreographies by Susana Domingues. 8pm Orpheum Annex, 823 Seymour Street, Vancouver. Tix $16 advance, $20 door. This Sunday January 11 at please join the Dance Centre for a free studio showing of work supported through their DanceLab research program: Suf(fix) is a surreal meditation on the expanding definition of self and body in relation to technology and Transhumanism, created by choreographer Julianne Chapple and visual artist Ed Spence, in collaboration with dancers Maxine Chadburn, Kirstyn Konig and Ashley Whitehead. 3pm at Scotiabank Dance Centre. All welcome! Again via New Works, next Sunday January 18 Dance Allsorts will present new works by Deanna Peters and Meredith Kalaman. Deanna Peters’ most recent production Cut Away features four performers aged 24 to 64: Barbara Bourget, Kim Sato, Deanna Peters and Elissa Hanson. Blending their histories in Butoh, hip hop and contemporary dance, they navigate how to move together, creating countless combinations that reveal where they overlap and where they diverge. Through her “eye-popping” and “thrilling” productions, Deanna explores new ways of engaging audiences, performers and other artists in dance. At a free workshop, immediately following the show, open to all ages and abilities, Deanna and collaborating performers will share some of the improvisational structures used in the work. ~ by DanceHouse on January 9, 2015.